Have a book of pictures and or a bag of unusual items ready or introduce a selected sample “Story Inspiration”. Whilst one of the group is scribing, have the rest drawing pictures connected to the theme or to the chosen items. The scribing activity is popular so there should be pleasurable anticipation from being in a scribing group. Introduce parents to scribing and train a few available parent helpers. Scribing is an ideal activity for parents wanting to assist. 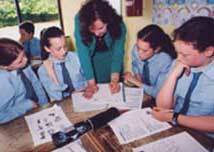 Train some children from the senior classes as scribes. Older children love to help the little ones. I have frequently seen eleven year old boys, with nothing but football on their minds taking their scribing responsibilities very seriously. The older scribes will benefit from the active listening, the writing, the spelling and presentation aspects of scribing. They may be able to make use of computer time to type, check, and format the work of younger children. Make a set of scribed story books for the library. Scribes and authors need to know that they can talk as much as they like but only to their own writing partner. Once this is understood, a quiet working atmosphere quickly establishes itself. The teacher may introduce a story topic, but the downloadable “story inspirations” will quickly guide the young scribes and encourage them to ask questions. The young writers don't have to complete a full short story every time. it might be appropriate to write a part of a story. If they have a lengthy story plan they may chose to write one episode, perhaps concluding with a cliff-hanger. It helps if local teachers are introduced to the concept before establishing the Author and Scribe groups. We gave initial familiarising and training sessions for parents but experience has shown this not to be essential. The groups may need initial support from an facilitator although the full preparation ideas and an introduction is given on each downloadable “Story Inspiration.” Experienced groups with supportive librarians will be able to create resources for themselves. Although groups ithat we have run have been open to all ages, feedback suggests that a separate “starter” group for the four to five year olds might be very helpful and offer the opportunity to meet the specific needs of this group. Very young children love to talk and to ask questions. They frequently tell themselves stories as they play. One-to-One scribing is can be extremely effective with this age group. It can also be used with pre-schoolers or in the playgroup. Very young children enjoy hearing their own stories read or told. Pre readers are encouraged to make connections between the written and spoken word Young children love to “read” their own stories and this can be an excellent way of creating personal first reading books. The author can stick the story into a book or onto an appropriate cut out shape. Giving older children (teens included) an opportunity for creative brainstorming. Sometimes in creative writing possible ideas drift around the mind but vanish the moment the pen touches the paper. Taking notes for the person planning a story, or essay can commit those first ideas to paper, providing notes for the writer to use. 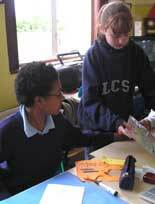 Support for planning and structuring stories, essays and projects can also be offered in this way, either in school where the scribe may be teacher or peer, or at home. Giving an overloaded or tired young person a break. Sometimes just acting as a temporary “dictation machine” can change the mental focus on a piece of work and make it seem manageable again. Offering a “scribing” break can create renewed enthusiasm. 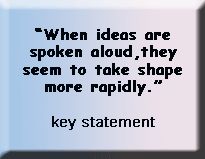 It also offers opportunity for bouncing ideas around with the scribe and can spark new avenues of thought. Often reading back scribed pieces to the author will enable him or her to reflect on the work and find new direction and possibilities.